Yesterday I finished and donated this quilt to auction at Odyssey After School’s fundraiser in February. 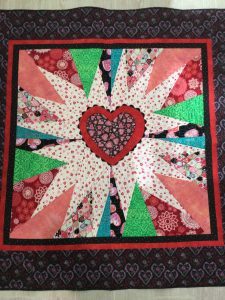 It is appropriate that I make a heart quilt for them as I love sewing and crafting with those kids and it is after all that time of year! This is a free pattern from Anna Maria Horner. I used primarily Valentine fabrics and did lots of custom quilting on it. I hope someone at the luncheon likes it enough to take it home. That is so nice – looks valentine-y but not overly so, and it looks clean and up-to-date with your fabric choices. Someone will be lucky to have it and show it off all year!